Please be aware that SHS has a “no-show” policy. This means that if you do not come to your appointment -OR- cancel the appointment less than 2 hours prior to the scheduled appointment, a $10 charge will be added to your tuition statement. This policy is in place to ensure that students are seen as quickly as possible. Students who arrive late, no show for appointments, or cancel at the last second, unfairly deprive other students of timely access to care. Be sure to have your Pitt ID and health insurance card ready. It is recommended you arrive 10-15 minutes prior to your scheduled appointment. Upon arrival at the Student Health Service, you must check at the Front Desk to validate arrival in SHS system. This will alert the clinic staff of the patient’s arrival and also avoid any late penalty fees. The Front Desk attendant will also update your health insurance information at the time of check-in. During the “check-in” process, the student will view the HIPAA confidentiality statement and also the “Consent for Treatment” agreement; they will be asked to sign the signature pad to verify the information presented; this is stored in the EHR. Depending on the nature of their visit, they may be asked to also complete a short questionnaire about their condition. Once the student completes the check-in process, Medicat ID labels are printed which may be used once in the exam room. The student is instructed to retrieve the labels at the reception desk and hold them until he/she is seen in the clinic where a nurse or physician will accept them. 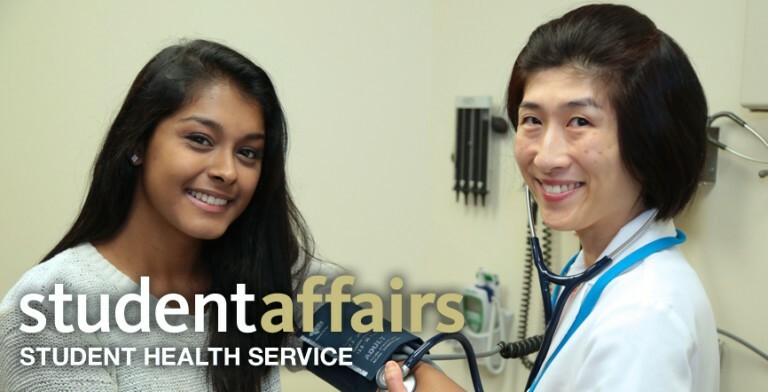 The Student Health Service does NOT issue medical excuses for students. SHS will, however, provide evidence of the student’s clinic visit by printing a receipt verifying the date and time of the visit. SHS will NOT release specific details about the student visits. You can suggest such a receipt form one of the receptionists at the Front Desk. It is the student’s responsibility to inform and negotiate with his/her professor or instructor in the event of a missed class or exam. The Student Health Service will, however, issue a medical excuse under rare, extreme circumstances. This must be approved by the Director of Student Health Service.